"This is an older recipe for fiddleheads passed down to me by my grandmother. Fresh trout is stuffed with a fresh fiddlehead stuffing, and then quickly roasted in the oven. 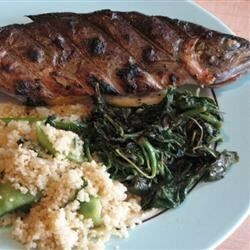 The trout used for this recipe is about 12 ounces. Recipe can easily be adjusted for larger or more fish." Spread about half of the margarine over the whole trout and inside the cavity. Combine the flour, salt and pepper; coat the inside and outside of the trout with the mixture. Melt remaining margarine in a large skillet over medium heat. Lightly saute the fiddleheads until just tender. Season with salt, pepper and tarragon. Add the lemon juice and white wine, and cook for one minute. Transfer the contents of the fiddlehead pan to a bowl, and mix with egg and bread crumbs. Stuff the mixture into the cavity of the trout, and place it on the greased baking sheet. Bake uncovered, for 15 to 20 minutes in the preheated oven, or until the fish flakes easily with a fork. Serve immediately. This was a very simple recipe and very good. Author omitted the oven temperature. I used a 350 degree oven. I've cooked this on several occasions now and have WOW'ed every audience. Its great on Salmon too.